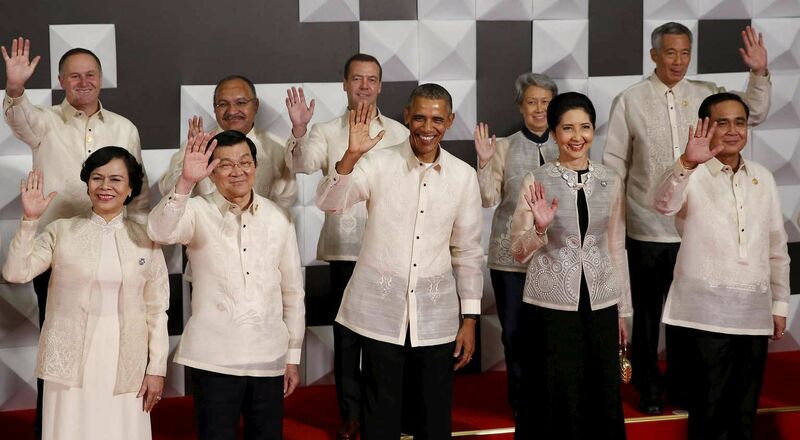 Asia-Pacific Economic Cooperation (Apec) leaders arrived at a state banquet in Manila last night donning what is possibly one of the most fashionable of national garments: the barong tagalog. The traditional shirts, each with its own unique embroidery design, were created by Filipino designer Paul Cabral, who had worked on them for the past few months. The semi-sheer fabric is made from pineapple fibre that has been mixed with silk, to give it a soft and comfortable feel. Mr Cabral said he created patterns that suit not just the wearer's build, but also his nation. He also designed outfits for the leaders' spouses. The barong for US President Barack Obama's lanky frame boasts bold patterns from American renaissance architecture. The design on Philippine President Aquino's barong was inspired by Filipino ancestral houses and his trademark ribbon. Chinese President Xi Jinping's barong features tall bamboo with cascading leaves, while Malaysian Prime Minister Najib Razak's has warrior shields from Sarawak. Japanese Prime Minister Shinzo Abe's has a cherry blossom design. Mr Cabral told The Straits Times that the barong for Singapore Prime Minister Lee Hsien Loong was "inspired by the swirls and geometric patterns made by Christmas lights and decors on Orchard Road". "I had to create patterns that would translate well to embroideries," he explained. And for maximum comfort, Mr Cabral said he added a satin lining on the tough collars to prevent itching. The tradition of dressing Apec leaders by the host country started in 1993, when US President Bill Clinton put his Apec colleagues in leather bomber jackets - the kind worn by World War II fighter pilots - before they posed for the obligatory "family" photo. Every year since then, leaders have gamely put on whatever their hosts prepared. These included batik shirts in Indonesia and Malaysia, silk jackets in China, hanbok in South Korea and ponchos in Chile and Peru. Whose barong is the most well-designed?